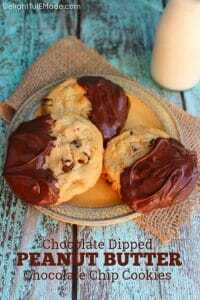 The ultimate chocolate chip cookie recipe! 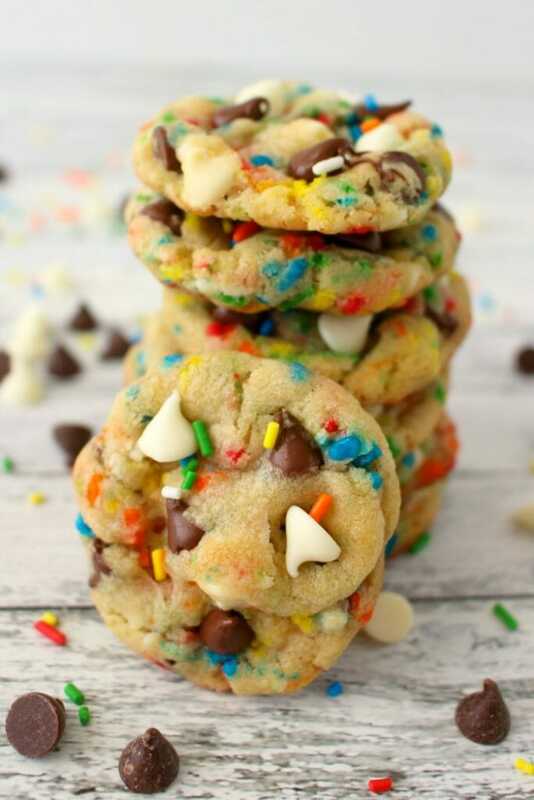 These Funfetti Chocolate Chip Cookies are loaded with sprinkles, white and semi-sweet chocolate chips, and packed with some serious flavor. 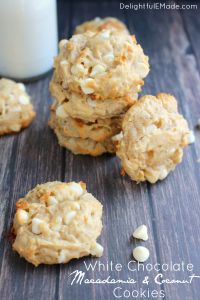 Perfectly chewy, these cookies will be your new go to cookie recipe! 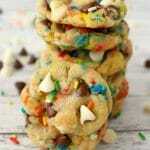 There are some days when a CRAVE a fresh batch of chocolate chip cookies! I’m not much for store-bought cookies, as I particularly love a cookie that’s soft and chewy and especially warm! I can eat a dangerous amount of cookies in the hour after they come out of the oven. 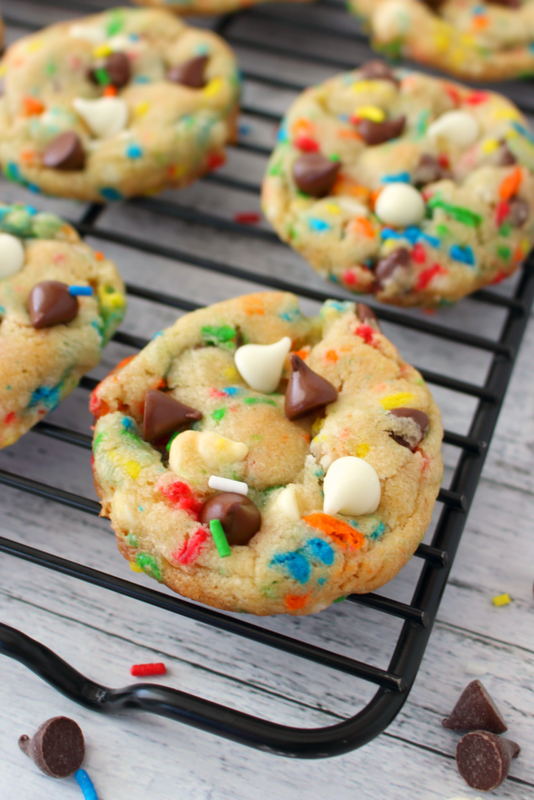 That is especially the case with these incredible Funfetti Chocolate Chip Cookies. 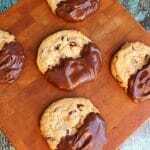 Not your average chocolate chip cookie recipe, these cookies have a few ingredients that set them apart. 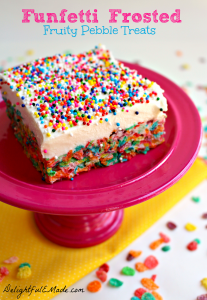 To take on the unique flavors of birthday cake, I’ve mixed in some funfetti cake mix, along with the addition of rainbow sprinkles. 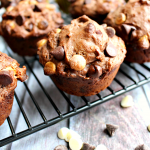 Throw in white chocolate chips along with semi-sweet chips, and you’ll have a chocolate chip cookie that is perfect for feeding your most intense cookie craving! Like other cookie recipes, you’ll begin by creaming together your room temperature butter, sugars, eggs and vanilla. Next, in a separate bowl you’ll mix together the flour, cake mix, salt, and baking soda. 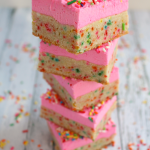 I would actually recommend sifting the dry ingredients, as some cake mixes tend to be slightly lumpy. 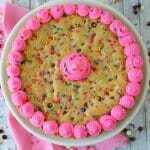 Because of the little flecks of confetti in the cake mix, sift as much as you can through the fine mesh, and then toss in the little bits of the confetti pieces to the rest of the dry ingredients. Gradually mix in the sifted dry ingredients to the wet ingredients, stopping to scrape down the sides of the bowl. Dough will be thick. 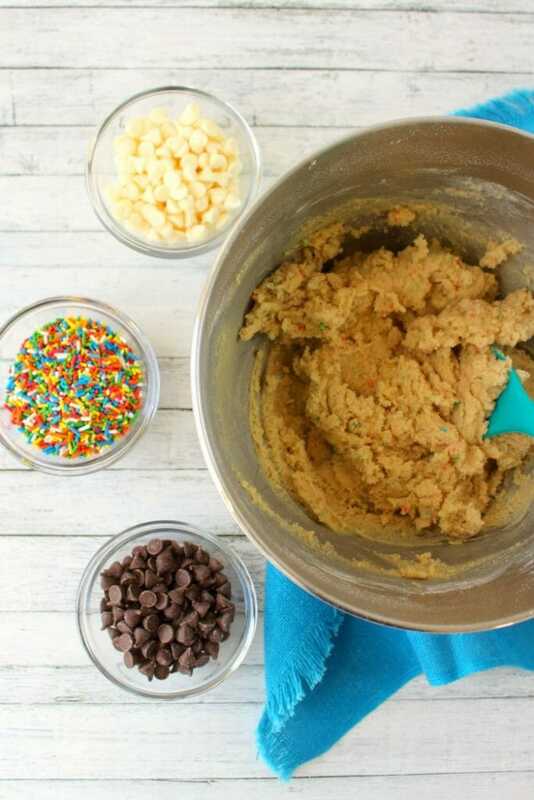 Once the cookie dough has come together, you’ll then stir in the chocolate chips (white and semi-sweet) as well as the sprinkles. 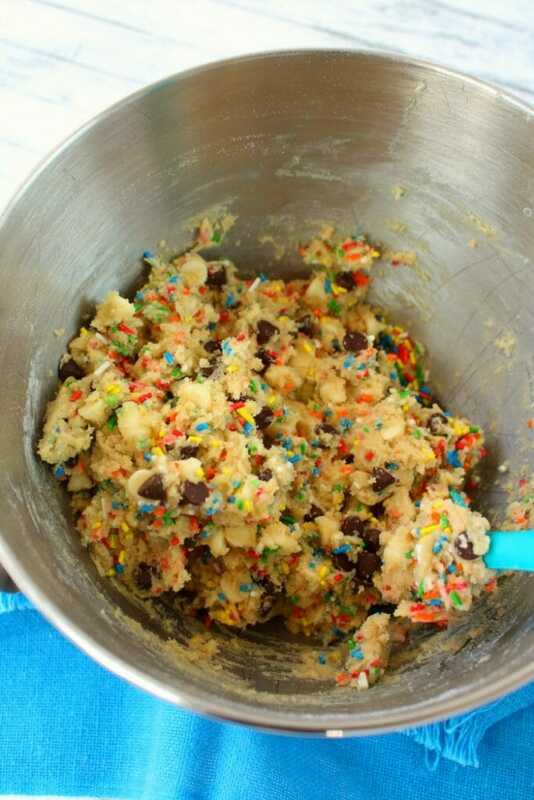 When stirring everything together, you’ll end up with a very colorful dough! From here, turn out the dough onto some plastic wrap. Wrap the dough, and refrigerate for at least 2 hours or up to two days. I’ll often mix up this dough the night before, and then bake off the cookies the next day. Once you’ve refrigerated the dough, and are ready to bake off the cookies, unwrap the dough and let it come to room temperature for about 10 minutes. I like to use a cookie scoop to help form the dough balls, as this helps keep the cookies somewhat the same size. Roll the dough in your hand to form balls, and then place on a cookie sheet. Bake the cookies at 350 degrees for approximately 9-11 minutes. For my oven, the sweet spot is right at 10 minutes. Once the cookies come out of the oven, let them sit on the baking sheet for about 5 minutes. This gives the dough and chocolate a chance to cool and set. From here, transfer the cookies to a cooling rack to let cool completely. Feel free to enjoy these cookies while they’re still warm. 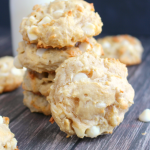 Perfectly chewy on the inside, these cookies are fantastic for dunking in a cold glass of milk, or a hot cup of coffee. 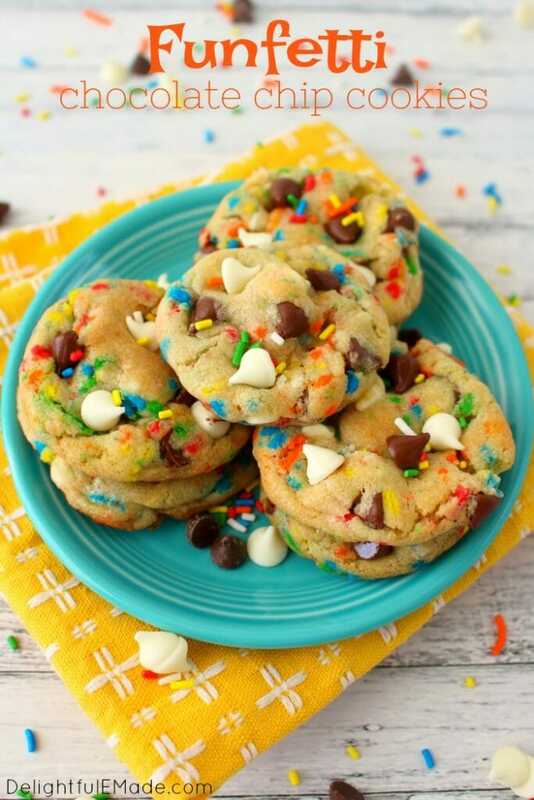 You’ll definitely love the birthday cake flavor, and with the extra sprinkles these cookies would be fantastic for a birthday party, or a fun classroom party treat! With a hand or stand mixer, cream together the room temperature butter and sugars. Add in the egg and vanilla. Mix together until completely incorporated and smooth. 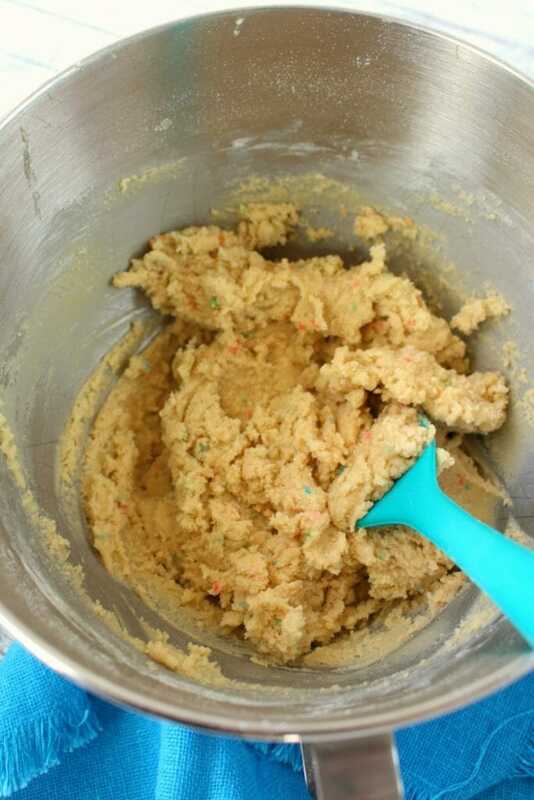 Gradually begin adding the sifted dry ingredients to the wet, stopping the mixer to scrape down the sides of the bowl. Batter will be very thick. 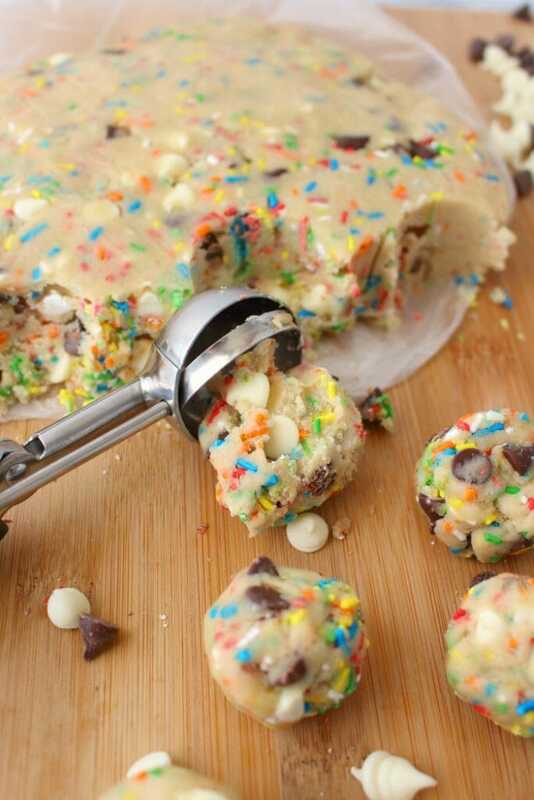 Stir in the semi-sweet and white chocolate chips as well as the sprinkles. Pour dough out onto a piece of plastic wrap. Wrap and refrigerate dough for at least 2 hours or overnight. Take out dough from refrigerator. 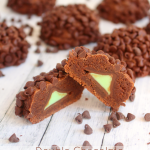 Using a cookie scoop, roll out balls of dough using your hands. Place on an un-greased baking sheet (line with parchment paper or a silicone baking mat if you prefer.) 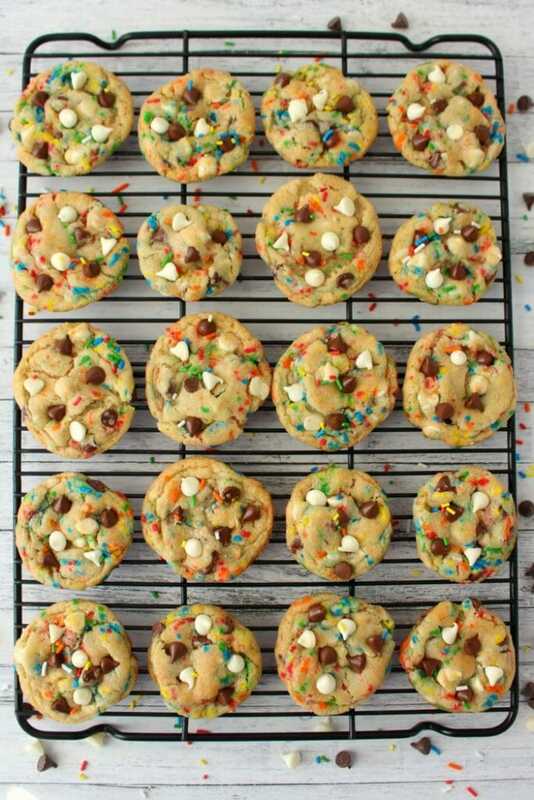 Bake cookies for 9-11 minutes at 350 degrees. Let cookies cool on baking sheet for 5 minutes before transferring to a rack to cool completely. SO colorful and so yummy looking! Pinned. 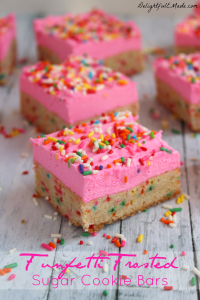 Sprinkles always make everything fun! 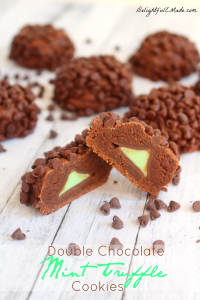 These are perfect for a simple St. Patrick's Day treat. Pinned and featuring on this week's MM.